MILLINOCKET, Maine — The Town Council voted 5-1 on Thursday to hire Millinocket native John Davis as the new town manager. The 59-year-old Davis will leave his job as Frenchville’s town manager on March 31 to succeed retiring Town Manager Peggy Daigle on April 3. Daigle has held the job for almost two years. Davis will be paid about $59,000 annually, said Councilor Michael Madore, who acted as the meeting’s chairman in the absence of Richard Angotti Jr.
Madore and Councilor Gilda Stratton praised Davis, while Councilor Richard Theriault, who cast the opposing vote, questioned Davis’ decisiveness. “If we are going to grow the town again, I think John is going to grow with us. I think he will be decisive,” Madore said Thursday. “He has good communication skills and a vast knowledge of the area. “People have said that Millinocket is a dead town. I don’t believe that. If I have one positive thought about this town, it is that it is going to last forever. People are not going to let this town die,” Madore added. “He is vested here, he has property here and hopefully he will be here for a long while, so I truly support him,” Stratton said of Davis. Theriault said that long-time residency and property ownership “aren’t strengths for me” and that he favored the job’s other finalist, whom he felt was more decisive and had better leadership skills. “This candidate does not meet my needs and I wish him well, but I will oppose this,” Theriault said before the vote. 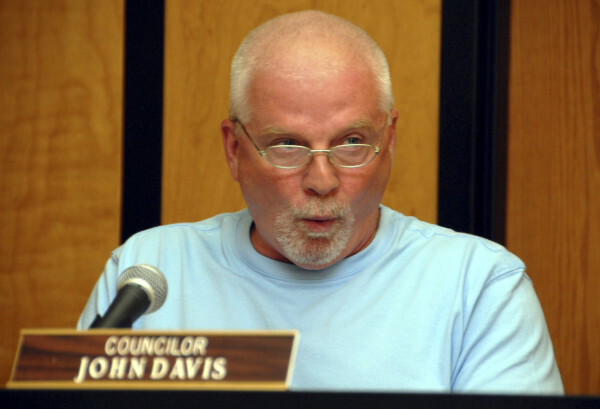 Davis, who did not attend the council meeting, is paid $46,920 to oversee 11 workers at the town office and the town transfer station in the northern Aroostook County town of about 1,000 residents. He has worked for Frenchville since October 2013. The position was his first in local government, according to Davis, who has a bachelor’s degree in public administration from the University of Maine at Augusta and is a course shy of a minor in business administration. Davis was a millworker for 35 years before being laid off from the East Millinocket paper mill and going back to school in 2004. Theriault thanked Daigle for her tenure. “She has done a fantastic job keeping our head above water. Some people don’t believe our fiscal problems are as large as they, but they are very, very large. If she wasn’t sitting here today, a member of the governor’s office would be running the town,” Theriault said. Millinocket’s economy has suffered for the last 20 years from the contraction of the state’s papermaking industry, a decline exacerbated by the closure of a Katahdin Avenue paper mill in 2008 and the East Millinocket mill last year. Davis served as Millinocket’s Town Council chairman from November 2004 until taking the Frenchville position. He was re-elected to the council in 2009.